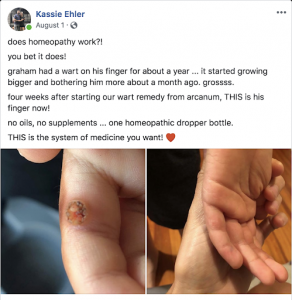 Does homeopathy work?! You bet it does! ‘G’ had a wart on his finger for about a year… It started growing bigger and bothering him more about a month ago. Grossss. Four weeks after starting our wart remedy from Arcanum, THIS is his finger now! No oils, no supplements… One homeopathic dropper bottle. THIS is the system of medicine you want! « Water Tastes Boring! Does My Coffee Count Towards Hydration?